Win Menashe: A touching story of tradition | SWITCH. 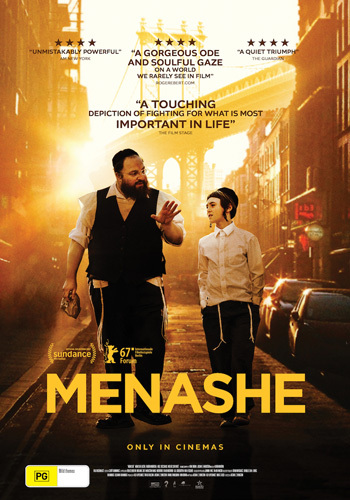 Performed almost entirely in Yiddish, a language not used in cinema for many decades, 'Menashe' follows a kind, hapless grocery store clerk as he struggles to make ends meet and responsibly parent his young son, Rieven. In the wake of his wife’s death, tradition prohibits Menashe from raising his son alone, so Rieven’s strict uncle adopts him, leaving Menashe heartbroken. Meanwhile, though Menashe seems to bungle every challenge in his path, his rabbi grants him one special week with Rieven before his wife’s memorial and a chance to prove himself a suitable man of faith and fatherhood. The 'Menashe' competition has now closed. Winners will be announced shortly. Competition opens at 5pm AEDT on Sunday 28th January 2018 and closes at 11:59pm AEDT on Sunday 4th February 2018. Ten winners will be chosen at random on Monday 5th February 2018. To successfully win, entrants must fulfil the above entry conditions before the time the competition closes. Current members/followers are eligible to enter the competition. Only one entry per person. Only one winner per household. To be a valid winner, the entrant must not have won a prize from SWITCH within the last 28 days. Each winner will receive one double pass to 'Menashe'. By entering, you agree to receive occasional emails from SWITCH in the future. If you decide to unsubscribe from these updates, any further entries will not be applicable. Only Australian residents are eligible to enter. 'Menashe' is in cinemas from Thursday the 8th February 2018 through Rialto.